Athol Public Library on Saturday. ATHOL — Service dogs are great companions and assistants for people with a disability, but what may be lesser known is the effort it takes to train them. 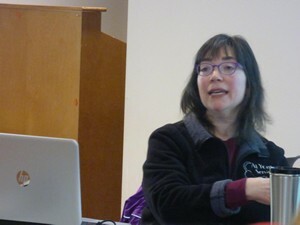 On Saturday at the Athol Public Library, Sharon Wachsler, owner and head trainer for the Wendell-based business At Your Service Dog Training, gave a presentation on everything that goes into training a service dog, which takes a significant investment in terms of finances, time and energy. “Having been through it myself back when fewer people were doing it, I know how amazing it can be,” she told the crowd, going on to say there is an “empowerment and pride” that comes with successfully training a service dog. About 20 people attended the event, comprised of people who were either interested in training a service dog for their own disability or to help a loved one. A service dog is different from a therapy or emotional support dog. A service dog is trained specifically to help with the disability of its handler, whether it is a physical or mental condition. For example, a service dog could be trained to perform tasks for someone who is a paraplegic or quadriplegic, or for someone with post-traumatic stress disorder. Wachsler said her experience with training service dogs goes back to the 1990s when she herself was disabled, which she eventually recovered from. She said she was disabled for 18 years as a result of several illnesses that afflicted her over that span, starting with multiple chemical sensitivity and chronic fatigue syndrome. After being bit by a tick, she also became sick with tick-borne diseases, including Lyme disease. She said her illnesses left her bed-bound, needing a wheelchair to get around and she was often nonverbal. Two main reasons she cited for the health recovery she made in 2013 were antibiotics and a neuroplasticity-based rehab program she went through. After her recovery, she said she began apprenticing with other trainers and went on to open her own business at the end of 2014.